Last week at Gilze-Rijen Air Base, the Royal Netherlands Air Force (RNLAF) held a ceremony to formally inaugurate the new training facility for its C-130H and KDC-10 full-mission simulators, and to renew the existing Partnering Agreement between CAE and the Netherlands Ministry of Defence (NLMOD). The ceremony was attended by Lieutenant-General Dennis Luyt, Commander of the Royal Netherlands Air Force; Ron Kolkman, Director of the Netherlands Defence Materiel Organisation and Joint Information Management Command (DMO/JIVC); Peter Noordanus, Mayor of the City of Tilburg; and other NLMOD officers and CAE executives. The CAE-built C-130H and KDC-10 simulators, originally delivered in 2009 to CAE's Amsterdam Training Centre in Hoofddrop, were recently relocated by CAE to the RNLAF's new training facility called GATE 2 next to the Gilze-Rijen Air Base, which is located between the cities of Breda and Tilburg. The NLMOD and CAE also renewed the Partnering Agreement between the two organizations. CAE has provided the NLMOD with training systems and services on a variety of platforms, including the C-130H, KDC-10, CH-47, NH90 and others. "Our C-130s and KDC-10s play a vital transport and tanker role for the Royal Netherlands Air Force, and this would not be possible without our highly-trained and skilled aircrews who support our missions," said Lieutenant-General Dennis Luyt, Commander of the RNLAF. "We are increasingly leveraging our simulation systems for more of our training requirements, and a partnership with a company like CAE can help us achieve greater efficiencies and innovative approaches as we enhance our simulation-based training capabilities." Since delivery in 2009, CAE has provided comprehensive maintenance and support services for both the C-130H and KDC-10 simulators, and will continue to do so at Gilze-Rijen Air Base. The RNLAF operates the Lockheed Martin C-130H as a medium-lift transport aircraft, and operates the KDC-10 as a tanker and strategic transport. "We are pleased to have assisted the RNLAF in relocating their C-130 and KDC-10 simulators that are now ready-for-training at Gilze-Rijen, and look forward to continuing our collaboration with the Netherlands Ministry of Defence," said Ian Bell, CAE's Vice President and General Manager, Europe/Middle East/Africa. "Our company vision is to be the training partner of choice to our customers, and our partnering agreement is a great example of a mutually beneficial relationship that helps the NLMOD enhance safety, efficiency and readiness." Caption: (RNLAF_C-130H_KDC-10_sims_at_Gilze_Rijen_1.jpg): CAE has relocated the Royal Netherlands Air Force's CAE-built C-130H and KDC-10 full-mission simulators to a new training centre at the Gilze-Rijen Air Base. 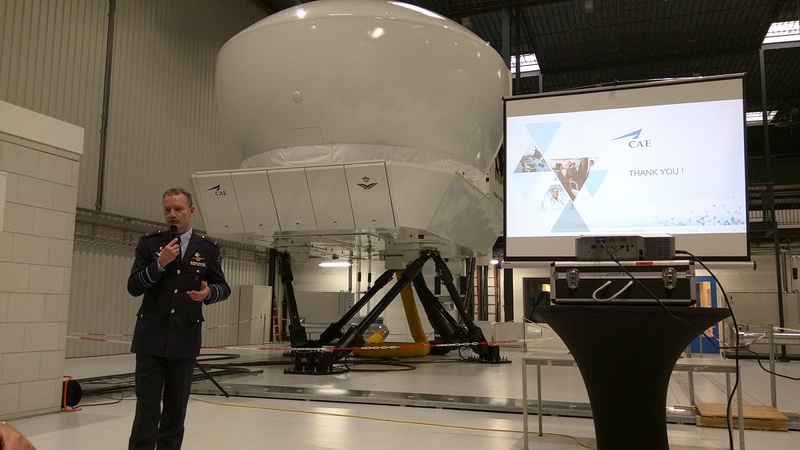 Caption: (RNLAF_Chief_of_Air_Force_Dennis_Luyt:.jpg): General Dennis Luyt, Chief of the Royal Netherlands Air Force, in front of the CAE-built KDC-10 full-mission simulator recently relocated to the Gilze-Rijen Air Base.